This post is sponsored by King Oscar | Thank you for supporting the brands that I love + trust! I can’t remember when I finally decided that it was okay to put anchovies on pizza, but I’m so glad I eventually snapped out of it. When I was a kid, I wasn’t as open-minded. The idea of putting little salty fish fillets on top of my prized pizza was grim; today, it’s a flavor bomb. Now don’t get me wrong—when I’m hit with a pizza craving, I go the classic route. But have you ever sunken your teeth into a pesto-slathered ‘za studded with salty anchovies? Because it’s a dream. To make things easy and approachable, I decided to bring the idea of a classic Pissaladière to pre-made flatbread. BUT. Traditionally, pissaladière was cooked and sold early in the morning in and around Nice, France. I’m not sure my waking tastebuds could handle the pow wow this bad boy offers before my morning coffee—but I’ll gladly eat it any other time of the day. I’m a bit of a canned fish snob which sounds hilarious, I know. You wouldn’t think canned fish and food snobbery could co-exist. But as someone who eats fish on the reg, I can tell you that there are fabulous canned fish and not-so-fabulous canned fish. King Oscar remains a brand that I swear by. Sustainably wild-caught off the coasts of Argentina and Peru, KO’s anchovies are pure glistening perfection. They’re aged in a salty brine for four to six months, leaving them with a fabulous flavor and texture. If you haven’t laid some of King Oscar’s anchovies out onto a pizza yet, you must. And why not this French classic? Get fancy! 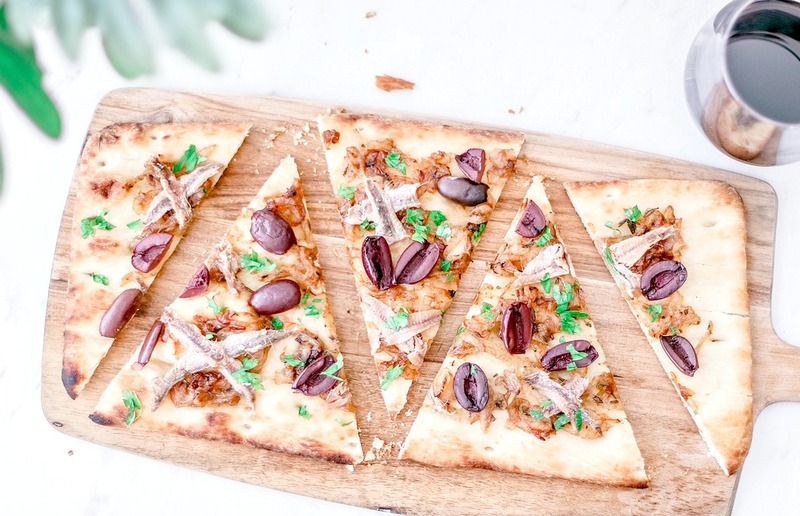 This recipe from Southern France brings sweet caramelized onions, briny olives, and salty anchovies to flatbread for easy and delicious entertaining. Chop/mince two of the anchovy fillets. Heat the olive oil over medium heat in a high-rimmed skillet or saucepan. Add the anchovy fillets to the oil with the thyme, grated garlic, and onions. Let the onions cook for about 20 minutes, stirring occasionally, caring not to burn. After 20 minutes, bring the heat to medium-low and add a pinch of salt. Stir, and let the onions simmer for another 15-20 minutes, or until golden in color and incredibly soft. Remove the pan from the heat and let the onions cool. Preheat the oven according to the directions of your flatbread or pizza shell. Once the onion mixture has cooled, evenly spread it over the flatbreads as your base. Place the anchovies over the flatbread in a criss-cross pattern, and finally, top it all off with the olives. Bake the flatbreads as per the directions on the packaging. When done, remove your flatbreads from the oven and garnish with freshly chopped parsley, if desired. KT - thank you for featuring my adaptation/picture! What a simply yet elegant recipe...in fact, I might just make it tonight to accompany a roast chicken I am brining. On second thought, perhaps dinner might just be this (on puff pastry again), topped with fried eggs. Breakfast for dinner! I look forward to trying more of your recipes....especially those featured on King Oscar's site! I wasn't that high on anchovies and sardines as a kid, but happily, my childish tastes have passed and your classic pissaladiere is a revelation to me -- the briny anchovies and olives are such an eye popping combination -- though I'd never think of it for breakfast. I'm more of a "pour a glass of wine and nosh on this as a pre-dinner snack". King Oscar is the only brand of canned anchovies and fish fillets that I'll buy -- the flavor and quality are off the charts. We're having company this weekend and I think this would make a deliciously different appetizer for them. Thank you!